through trees and masses of flowers. the delicate branches is a heavenly delight. masters when the snow happened to fall. Winter Glen remains one of my favorites." Add $50 for shipping & insurance. Winter Glen copyright© 1999 by Thomas Kinkade is prohibited from being copied. 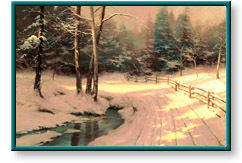 Thomas Kinkade art prints paintings canvases pictures images and artwork of Winter Glen can be purchased at discount prices at Christ-Centered Art. Winter Glen painting by artist Thomas Kinkade (also spelled Thom Kincade, Kincaid, or Kinkaid) can be purchased in art print or canvas form at special sale prices at Christ-Centered Art.